Family, that collection of people not unlike the accumulation of worms and grubs under a fallen tree in a moss eaten forest, ah family, where would we be without? Back in the day, when people were still being caned because somebody spilled coffee on the good sitting room rug, back in those days when kids like this here writer were banned from touching the china (not our fault of course, those things broke on their own), family meant bone-sickening, marrow-thinning togetherness all stuck together with some good ole' spit glue. These days families mean each member in their own room, either connected wirelessly to their computers or their TV sets and the amount of yelling it takes for your mom to get everyone assembled at the dinner table. At this point while the bua doles out the bhaat, your mom tells you of her adventures at the neighbourhood talim where middle-aged women who've recently found religion discuss why they lead such skewed lives. However it's not merely family life that has changed. A lot of things that once followed a set format are done quite differently, and to the cynical, with wholly different things in mind. And for those inclined towards economics, unnerving conclusions are made. Weddings Are Buffets: They can almost be defined as congregations, meant to bring together masses of people who believe in the same thing, i.e., free food and a good looking chick on a stage who won't mind you staring at her. Back in the day, these rituals still held some sentimentality. As a closer look today would reveal that they resemble buffets for those inclined towards food. The price of admission would be the gift you brought and the buffet package is generous enough to admit all other family members you happen to bring with you. For those not inclined towards the biryani, think of the wedding as a singles bar. With entertainment, i.e., that freaky band playing some Hindi song, even if they don't manage music, they do manage to pull of some awesome improv comedy the likes of which Hollywood has yet to notice. And as we said, there are girls on stage, all done up in saris and make up, and they won't mind you staring. Parents Come for Free: Before empowerment and mass education happened, before Internet and Wikipedia everything a parent said was a testament engraved in stone. Nowadays, with kids learning about margin theory in grade eight (grade eight?! We have suffered my holy brethren), everything they say is a point of contention. Why? Because the little critters read on the net that a career in social work can be very uplifting. Parents come for free; they offer things beneficial for the good of all, like public goods. Unfortunately, the saying, give me free stuff and I'll misuse it, comes into play here. We tend to neglect our parent's worldly advice, we tend to mistreat them and in terms of benefit, the exchange never really happens. Children are Sunk Costs: Ah yes, those baby faced individuals with the twinkle in their eyes and the round cheeks that cruel aunties assault whenever they come over. Those individuals who break the china (unthinkingly, this writer still stands by his statement, the china breaks itself), who are supposed to be angels, who the parents spend oodles of money on to clothe, feed and educate. Back in the day, a parent wouldn't really expect much from his kid, except maybe retirement care later on. These days? These days, children have become investments. You spend on them, you keep them alive and then you send them out into the world with your name in the hopes that they will conquer the world, subjugate the masses, oppress nations and be the cause of the third world war. In other words, you hope they do everything you couldn't do and that they bring fame to the family name. That is the profit, if we are to be cynical, of all those years of love and devotion. The case study however shows these same kids growing up, failing their 'A' Levels with appallingly bad marks, subsequently getting a job at the some deadbeat firm and getting stuck in the rut their parents were in. In other words, the investment, turned out to be a sunk cost (those of you who didn't get it, it is quite unfortunate, you should have listened to your dad when he told you to take economics huh?). The National Minimum Rate of Pocket Money: In times when people still learned that there were only nine planets in the solar system, pocket money was something happened only occasionally and only when you're parents were feeling whimsical. 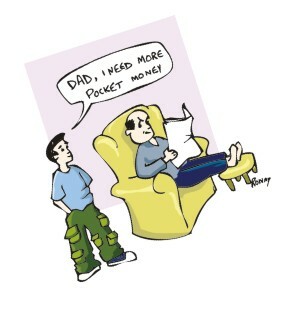 These days, pocket money is something kids can't do without. Back in the day, we would have our knees knocking together in the hopes of a 10 taka note. These days, there is a minimum rate that must be met. Otherwise, how can one reasonable parent expect his kid to meet his phone, Internet and pointless rickshaw ride costs? How my man, how? Critical analysis of the above points have led this writer to decide on an early retirement from the field of economics. It is painfully obvious that something's wrong with it when you can apply it to a family. A line in veterinarianism would have been better if it was so easy to spell. The writer spelt that wrong, he knows.